UK visa refused because the immigration officer suspects I'm trying to live in the UK through successive visits. What are my options? I am in a relationship with a UK citizen. We just started dating and in Oct of 2016 I went to visit the UK to spend time with them. I stayed from Oct 11th to Nov 4th. I flew home to attend my older sister's wedding and to return to work. I flew back to revisit my significant other on Nov 30th and was denied entry. The reason(s) I was denied entry is because I mistakenly bought a one way ticket, thinking that it wasn't going to be a big deal to just purchase the return when I got there (stupid mistake number 1), and also, I brought some hair styling shears with me to cut my significant other's hair and her Mom's for fun (no monetary gain at all) just as a nice gesture (stupid mistake number 2). The border official thought I was seeking employment because of me carrying that & having a one way ticket. They stamped an X on my passport and I was able to stay one day with my partner then flown back home on a return flight. Will I be refused again? Is there a way to check notes or restrictions associated with my passport? Is there a way to clear any such restrictions associated with me? 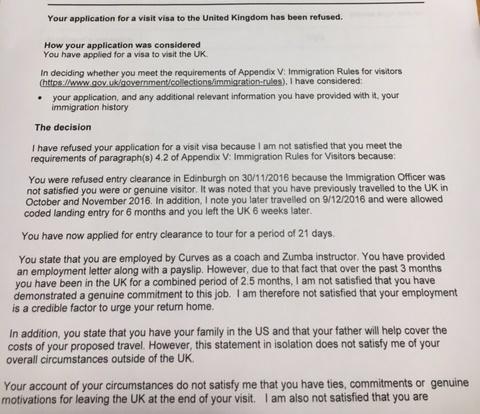 Can I write a formal letter to the UK Home Office to have a chance to clarify things? The pattern you described is fairly common. You as the US (or Canadian) national developed a romantic long distance relationship (LDR) with a Brit, and sought to maintain the relationship by using your status as a non-visa national to visit without a visa. Last year you were served removal papers and got a temporary admission of 1 day. We don't have the IO's transcript of your landing interview, but typically those situations involve some cat-and-mouse type of interaction that gets them more upset than normal. Then you applied for entry clearance (a good strategy), but were refused. They got you on V 4.2 (a+b+c), which is symptomatic of a person whose history indicates they are not a genuine visitor and should be using one of the other inward routes (a fiance visa for example). LDR's are fine, but the person needs to be leading a properly integrated lifestyle in their home country. They expect that during one of your visits you will likely go underground and engage in further abuse of the rules. Will I be refused again? We're not prophets, but it can be difficult to maintain an LDR after they have introduced V 4.2 (b) as a grounds. It means you have worn out your welcome and your visits suggest a further agenda (one characterised by abuse). Is there a way to check notes or restrictions associated with my passport? Yes, in general the UK has a procedure called Subject Access Request where they will release your records in a very limited form. It will not, for example, contain the transcript behind your earlier removal, and it will not include any information that might help you evade immigration controls. Is there a way to clear any such restrictions associated with me? Yes, the absolute golden solution is to get an entry clearance. This has the effect of wiping the slate to the extent that you have successfully established yourself as a genuine visitor who is using the rules lawfully. I recognise that just having been refused, this solution seems like a cruel tautological recursion. But as the Brits say, that's just "hard cheese". Can I write a formal letter to the UK Home Office to have a chance to clarify things? Of course. You can even petition HM (she is contactable at Buckingham Palace, via an assistant) or write to the Home Secretary. In either case you will get back a standard letter informing you that you are free to make a fresh application for entry clearance. In other words, do not expect very much. Entry Clearance Officers have a mandate from the government to make decisions on behalf of the Home Secretary and that's that. Visitor applications do not have appeal rights. The most frustrating part about all of this, is I am not, nor have I ever had any intention of trying to cheat the system or do anything illegal. There is a lengthy history of abuse with people in LDR's. They lie to the IO's, they waste time playing cat-and-mouse, they overstay, they tie up the courts, they evade fees and other requirements. So much so that they have been trying to contain it with rule changes for a long time (more than 20 years). So while your personal intentions are an unknown factor, you clearly fit the pattern and that's what they work from. I am beyond heartbroken because I think if I were to try and fly back to see my significant other again, I would be refused again. I don't know what to do. We both don't know what to do. All I want to do is spend time with the person I love. I'm not trying to do anything illegal. I just want to be with them. "Significant other", "partner", "the person I love", this is language that describes a serious commitment. As I mentioned above one of the settlement routes is more appropriate. They may be adjusting the financial hurdles following a court decision last week. In addition to fiance or spouse, you can also try the student route. Any help, options or advice would be greatly appreciated. More than you know. There are several immigration solicitors of national stature who specialise in entry clearance for LDR's. I took a law course in it a while back (and know the instructor personally for about 23 years) and it was very well attended. Use the search pages at ILPA. For comparative purposes, the interested reader is invited to view the OP's thread at UKY. It's a forum dedicated to American women trying to marry Brits and lots of their advice has sound practicality. They are not legal professionals, their very impressive experience derives from tens-of-thousands of threads, so always double check their stuff to make sure. Also for comparison purposes, the OP published her thread on Immigration Boards. Some IOs were surprised, and suspicious, when people travel to spend time with someone they hardly know or have never met. If people are going to visit someone in another country, IOs assume they will have had recent or regular contact and will know something about the other person. Internet relationships attract particular attention. Thanks for posting the refusal, it clarified a lot that wasn't as visible in your question. Let's start from the bottom. You were refused under paragraph 4.2 sections a, b and c, so let's bring them up for reference. ECO not only thinks that there is a secondary motive to your visits, but that this motive is to eventually settle in the UK. And that is something not to take lightly, as anyone suspected of seeking to settle in the UK illegally will struggle with future applications. To understand why ECO arrived at this conclusion, try to look at the situation from his perspective. You have started dating a person in October, and since you've spent most of your time (2.5 out of 3 months period) in the UK across multiple visits. Given how short is your relationship, this type of absence is unlikely to be planned, and most people who have ties to local community would struggle to be suddenly absent for most of 3 months and then seek additional month. Just from work perspective, who can take almost three months of vacation without pre-arranging that with your employer well ahead of time? Not to mention missing your friends, family, and out of work commitments, you may have which usually tie you back to local community. When you put it together with your reason for a visit, it makes it very likely that you will continue that pattern of spending more time in the UK than you do back home. It also brings up the possibility that you may decide to not leave after one of your visits and instead go underground. All this means that you will very likely be refused on any subsequent visas as a visitor in the near future, as you will need to show unyielding ties back home and only time can fix this. But not all is lost. Since you are happy to spend most of your time in the UK, why not take it step further and try to apply for Tier 2 (General) visa? If you are a skilled employee, obtaining a sponsorship should not be outside of your reach, and then you could reside in the UK, with visits back to your home country. You may be interested in reading more about the process on the gov.uk website. In the meanwhile, your special someone could visit you in your home country, although you will be best to make sure not to repeat the mistakes you've done with UK immigration and keep the visits longer, better planned, but less frequent. You could also fly together to neutral countries for short vacations. Regarding the note in your passport, that is what they call a coded landing, which is, in essence, a note to future immigration officers. It is almost always nothing to worry about. If you want to find out what it means, you would have to fill in SAR to receive its content. One of the notes in your refusal letter is that the ECO has not got a clear picture of your situation back at home. That includes financial situation. The new application for entry clearance should be accompanied by a letter where you justify paragraph by paragraph the parts that looked suspicious to the ECO that made the refusal decision. The justification should be done by FACTS. For example, it does not help if you say that your father will help you buy the ticket, but it does help if you provide a signed letter by your father together with the copy of his id as well as his financial history (of at least one of his bank accounts with sufficient funds) of the last three months. A letter from your current employer stating that they agree to you taking days off, or your contract of employment stating your employment terms and conditions showing that even if you make long absences, you would still be welcome to work there. Show any ties with your home country. For example you can provide bills or statements showing that you still live with your family or some statement that has got your address in there and some statements of your parents with the same address and a certificate of birth to show the connection you have with them. The visitor rules are in Appendix V. It is helpful to thoroughly review them prior to making your application. How to fill out and apply for Subject Access Request (SAR)? Can I enter the UK visa-free after being refused a visitor visa? Denied entry to the UK after having student visa refused a week earlier, what are my options now? Fly to visit partner in UK with time in between refusals?